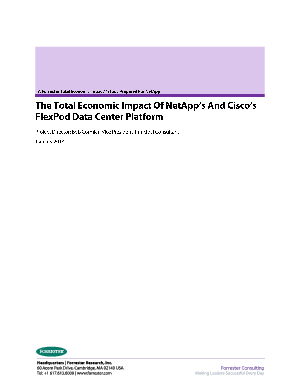 In summer 2012, Forrester Consulting Commenced work on a research project commissioned by NetApp that focused on examining the potential ROI that enterprises may realize by adopting the FlexPod platform. Co-developed by NetApp and Cisco Systems, the FlexPod platform is a predesigned converged infrastructure solution built on Cisco Unified Computing System (UCS) servers, Cisco Nexus data center switches, NetApp FAS storage with Data ONTAP components, and software from a range of partners. This study highlights the benefits of deploying the FlexPod platform across the enterprise of a composite organization.